If you are looking for a different camping holiday, superior hospitality, and excellent on-site amenities, Les Méditerranées Nouvelle Floride is one of the best choices out there. 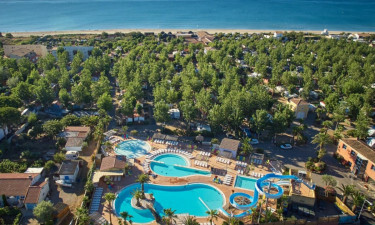 This luxury campsite is ideally situated in southern France and offers superb accommodation options, easy access to vast sandy beaches, and a family-friendly environment. Book your spot at this luxury camping site with Lux-Camp, the specialists in luxury camping holidays. Why should I camp at Les Méditerranées Nouvelle Floride? Accommodation at Les Méditerranées Nouvelle Floride is available in three different areas so that guests can choose the perfect environment for their needs. Accommodation is available in stylish and spacious 3-bedroom mobile home cottages with air-conditioned living space, a private deck, and a full kitchen. Les Méditerranées Nouvelle Floride allows guests to make the most of its seaside location and to enjoy a fun-filled holiday in the Mediterranean. Guests can start their day with a visit to the campsite's beach club, which offers zumba lessons, water aerobics, aquabike, and a whole range of fitness activities to suit everyone's interests. The campsite has a beautifully landscaped swimming pool complex, which comes complete with water slides and an artificial whirlpool river. Families with young children can take advantage of the campsite's supervised kids' club, where a varied range of activities are organised on a daily basis. Every effort has been made to ensure that guests enjoy a superior camping experience no matter what their idea of a perfect holiday might be. Those looking to keep fit, have fun, or explore the surrounding area will enjoy the site's bike rental service and sports tournaments. Guests who'd rather relax and enjoy their time off can head to the on-site spa and enjoy a relaxing massage, a sauna session, or various beauty treatments. Les Méditerranées Nouvelle Floride takes care of all catering needs with its spacious and tastefully decorated restaurant, which offers a choice of indoor and outdoor seating areas and a delightful a-la-carte menu. There is also a take-away outlet and a charming beach bar that contributes to the lively atmosphere of this luxury campsite. The campsite's mini-market stocks everything needed for a convenient self-catering holiday. And why not stop by the bakery and grab some freshly baked pain-au-chocolat or other scrumptious breakfast items?